Mr. Bottar is one of upstate New York's most experienced and accomplished trial lawyers, with a track record of extraordinary recoveries for his clients. 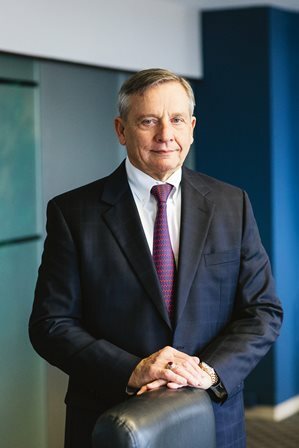 As the founder and managing member of Bottar Law, PLLC, he brings more than 40 years of experience to the pursuit of cases involving birth injuries, brain and nerve injuries, amputation, paralysis, and wrongful death due to medical negligence, complex accidents, workplace injuries and defective products. Mr. Bottar has been continuously listed in The Best Lawyers In America® since 2001, and is the only attorney in Syracuse recognized three times as the Best Lawyers® Syracuse Personal Injury Lawyer of the Year (2018, 2014-15 and 2009). He has attained an AV® Preeminent™ rating from Martindale-Hubbell, the highest rating available for legal ability and professional ethics, is a fellow in the Litigation Counsel of America - Trial Lawyer Honorary Society™, and is a charter member and past-president of the New York State Academy of Trial Lawyers (2010-2011). In 2001, Mr. Bottar was appointed by the New York State Supreme Court, Appellate Division, Fourth Department to serve as a member of the Character and Fitness Committee for the Fifth Judicial District. The Character and Fitness Committee is responsible for screening and interviewing all Central New York applicants who are seeking admission to the Bar. In 2018, Mr. Bottar was also appointed by the Presiding Justice of the New York State Supreme Court, Appellate Division, Fourth Department to serve as a member of the Grievance Committee of the Fifth Judicial District. The Grievance Committee for the Fifth Judicial District is responsible for the investigation, review and prosecution of complaints of attorney misconduct in Onondaga, Oneida, Oswego, Herkimer, Jefferson and Lewis Counties. Mr. Bottar has been listed in Upstate New York Super Lawyers® for plaintiff's medical malpractice and personal injury since the inaugural edition in 2007, and was named to its "Top 50" list for 2018. Since 2011, he has been recognized annually by The National Trial Lawyers as one of the "Top 100" trial lawyers in New York State. He has also been honored by Lawdragon as one of the top 3,000 attorneys in the United States, and has earned life memberships in the Million Dollar Advocates Forum® and the Multi Million Dollar Advocates Forum®. Mr. Bottar regularly speaks or guest lectures at legal and non-legal functions, including ethics, tort and practice management classes at Syracuse University College of Law, and at annual updates on behalf of the New York State Academy of Trial Lawyers. He is a past member of the Dean's Advisory Council at the University at Buffalo School of Law, a has been elected a Fellow of the New York Bar Foundation. Mr. Bottar has a long record of public service and is deeply invested in New York State's education system. He served as a Trustee of the North Syracuse Central School District Board of Education from 1988 through 1989, and as the President of the Board from 1989 through 1996. He also served on the Board of Directors of the Onondaga Madison School Boards Association from 1994 through 1996. In 1996, 2001, 2006 and again in 2011, the New York State Legislature elected Mr. Bottar to serve as a Regent of the University of the State of New York, the most comprehensive and unified education system in the nation. Over his tenure as a Regent, Mr. Bottar was Chair of the College and Career Preparation Work Group, Chair of the P-12 Education Committee, and was a member of the Higher Education and Professional Practice Committees. He was also Vice Chancellor of the Board from 2012-2016. In 2016, after 20 years and more than 10,000 hours of pro bono service to the State of New York, Mr. Bottar retired from the Board. Mr. Bottar resides in Manlius, New York, with his wife, Nancy, a registered nurse. Author, Coastal Processes and Change: Legal Implications, 1 Sea Grant Law Journal 139 (1976).